This is Part II. Part I of Humpty Dumpty is here. he peasants have already finished their labor for the day and gather in the town square. Tired after a long day’s work, they make the best of their miserable lives until the steel reinforced carriage arrives with the deservedly hated tax collector. 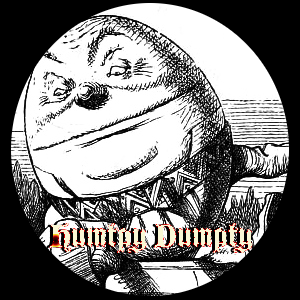 Humpty Dumpty, a rather large and brutish bald man, drags out of the carriage. “Don’t you ever look me in the eye!,” he shouts at one peasant as he slaps him across the face with his leather gloved hand. The peasant’s face turns red as his eyes water, but he dares not say a word in protest. Without speaking, the other peasant hands over Humpty Dumpty some coins. The peasant who got slapped earlier screams “No!” and runs forward to take a swipe with a rake at the tax collector. Humpty Dumpty’s driver moves forward to intercept the peasant, but Humpty Dumpty pushes his driver aside with one hand and grabs the rake with his other hand. Then Humpty Dumpty whips out his sword and cuts off both of the peasants hands. Without pause, Humpty Dumpty grabs the torch from his driver and chartreuses the wounds. No one dares to confront him. No one dares to make eye contact. They all look defeated in his general direction. Humpty Dumpty storms into a peasant’s home and pulls out a frightened teenage girl. The girl’s father wets his pants, but dares not step forward. He will cry profusely later on that night. The driver picks up the torch from the ground with a disgusted look and puts it back on the carriage. He waits for his Lord to step inside with the girl, grabs the reins, and drives off.